This is how the missal looked in 1942 when it was given to a twenty-four year old draftee. This is what the well-used spirited missal looks like seventy-five years later in 2017. Well-worn pages of prayers recited over and over. 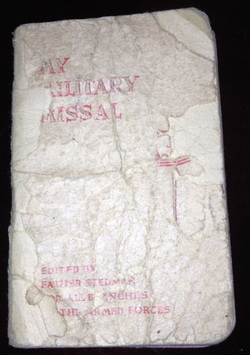 As I held the fragile Military Missal in my hands, I thought, "If only this prayer book could talk." It had been recently returned to my husband by our son-in-law who'd returned from combat in Mogadishu, Somalia. He was the third generation military man in the family to carry the tiny book over the last 50 years. I was filled with awe-inspired gratitude for the brave and selfless service of my late father-in-law, my husband and son-in-law to our great country. What amazing stories of courage, fear and faith this Missal could tell. The idea for the a book began to form. In January of 1994 I started a notebook to re-create Dad Panko's military history. The Army records in St. Louis had been destroyed in a fire. That single notebook grew to three notebooks and was the basis for the "Guiding Missal" story. I began my research by calling a wonderful man in St. Louis, Missouri who had served with Dad Panko. Fortuitously, he was the company historian and was able to put me in touch with a few other living company members. After long telephone conversations, each one agreed to provide me with information of the time they served with Dad. I received long handwritten letters, the 289th Cannon Company history book, war maps, and details about their combat experiences. The volume of material they sent was astounding. They related their experiences from basic training through the Battle of the Bulge and I became aware of incidents Dad had never told the family. Without this information, it would have been impossible to tell Dad's story. Joe Panko, Dad's brother, was serving in the ETO (European Theater of Operations) at the same time. They hadn't seen each other for two years and were coincidently reunited in France while waiting to be shipped back to the States. Uncle Joe added humor and laughter with page after page of stories of finding his brother George and their antics together. Living with my husband, the second generation military man to carry the Missal, made gathering information about his time in the service a little more convenient. He speciality was intelligence and cryptography. Convincing him to give me details was difficult, even 40 years after the fact. It helped if he had had a good meal and a glass of wine. Our son-in-law was eager to tell his story. We sat and talked while a tape recorder preserved the conversation, pausing when the memories got too intense. The details were important to him, because he had friends who died in the Battle of Mogadishu. He insisted. "You have to get it right. Men died. The story has to be right." Putting it all together I realized the narrator had to be the common denominator, the Military Missal. As I wrote, the tiny prayer book developed a personality and a life of its own. Infused with the Holy Spirit, the missal guided and protected each man through the routines of military life. It was fully engaged in the heat of each battle, its cover becoming worn and tattered. The Missal possessed an intimate knowledge of each man's heart and mind, bonding with him and expanding its sphere of influence to the his family. Although based on facts, "Guiding Missal" necessarily became a work of fiction as soon as the prayer book became the narrator of the story. Some character names and situations have been changed for privacy purposes.